Posted in Misc and tagged Crying Chair, Daft at 5:25 pm on January 22, 2018 by Bodger. The microwave and kettle are on the draining board, and you can touch a water source and the cooker at the same time, both of which should make it illegal to let. Daft don’t care if it’s legal or not. There are some right chancers around NCR and the quality is downright awful. BER Exempt … so it’s a place of worship has less than 50m2 of useful floor space. That’s so grim. Also, €900!? I rented from a Matt Brady [Owner] in the mid 90’s on the NCR. He had quite a few houses in the area. I’m guessing it’s the same guy. I paid 45 Punts a week back then.. .
Yep that will be him, rented from him myself on the NCR in 2004ish. Twas 115 euro a week then but in fairness it was about four times the size of this. Shared showers in the house, Matt was charging us a euro for one of his tokens which delivered 5 minutes of hot water. “Studio apartment” my fluffy bumhole! 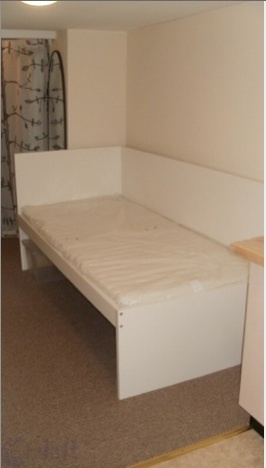 Shiddy bedsit! I’ve reported it as being substandard. Everything is getting downsized, no “crying chair” just a lousy little stool. Grim indeed. Whats the point in working in this city if this is your reward? Paying up to some slum landlord. A joke!!! 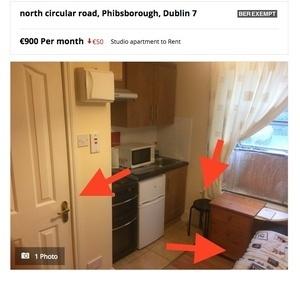 Don’t worry, Minister Eoghan Murphy is sorting this out by changing something about mortgage interest rates or something. You’ll get nothing but “private market solutions” out of this right wing government, remember that when the next election comes around. Anyone who votes for FFGLAB is voting for the status quo and is apparently content with this abominable situation. The neighbours will delighted with the likes of you around no doubt. BS, again, your banning means diddly. 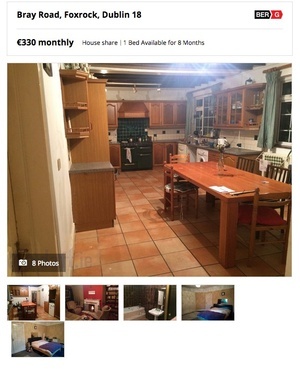 All mod cons, & shur they’re only delighted to present this hape a shiiiihite to the market. Viewing is highly recommended. Rarely does a gem of this nature become available. All mod cons..thrilled, delighted etc. Fupping gougers the lot of them. What a great recovery though. Where would we be only for Baldy Noonan? What an arse festering sh*t hole we’ve become. Pic has been taken down. Also, first listed @ €850 – 01/01/2018, then down to €800 – 06/01/2018, now up to €900 – 22/01/2018. Was it not down €50 yesterday? Looks like Daft’s metrics are well… daft. 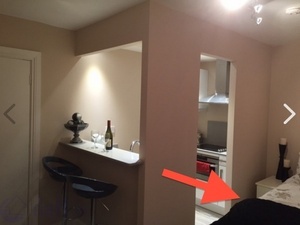 is that window boarded over with cardboard?! Been doing a lot of looking into companies advertising on daft and myhome, and those companies are shafting the people who advertise with them also. Not that either side deserves sympathy, just interesting. Like people pay to advertise and these sites claim to have created sites for them that never exist. 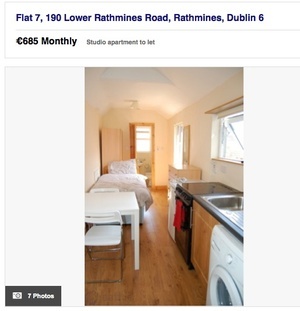 More laughable poo from the Housing market in Dublin. Can you imagine how much Charlie the Estate Agents are getting through nowadays? I know they lost the run of themselves in the previous boom, but now?! I’m thinking, Tony Montana face down on his desk levels.